This week marks the official opening of Michael Mina's second restaurant in Silicon Valley (Arcadia in the ground floor of the Downtown San Jose Marriott was the first). Bourbon Steak & Pub combines both a high-end steakhouse and a more relaxed Pub environment. The Pub will have 50 craft beers, farm-to-table cuisine, and 70 HDTVs for watching sporting events. 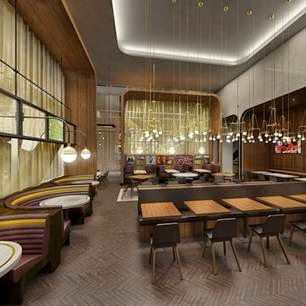 On the other hand Bourbon Steak will offer a premium dining environment with Certified Prime Angus steaks, Japanese Wagyu, and Dry-Aged Duck. The restaurant will be open all year round and will have special events during game days. For more information, scroll down for the full press release. You can make reservations over here. (SANTA CLARA, CA) – Bay Area culinary great Chef Michael Mina has unveiled Bourbon Steak & Pub at Levi’s Stadium®, a new concept in stadium dining. Bringing a high-end steakhouse and relaxed pub together under one roof, Bourbon Steak & Pub offers a range of dining experiences to suit the needs of sports fans, foodies, concert goers and local residents alike – seven days a week, all year long. Bourbon Steak & Pub is now accepting reservations beginning Aug. 11. 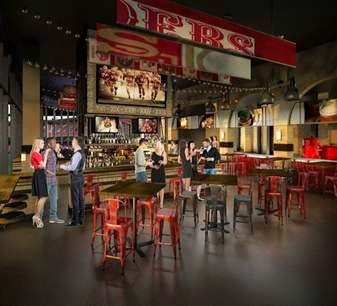 Bourbon Pub will be the premier lunch, dinner and gameday destination offering the perfect space to kick back and cheer on your favorite teams while enjoying a variety of 50 craft beers and a vast menu filled with reinvented bar bites. Bourbon Pub will serve fresh, farm-to-table cuisine that reflects the spirit of a modern pub at affordable price points. With a focus on shareable dishes, featured menu items include Berkshire Pork Ribs, a Ecopia Farms Greens salad, the Bourbon Burger, Smokin’ Double Barrel Wagyu Dog, Crispy Flounder Fish & Chips and a 38 North Half Chicken straight from the restaurant’s one-of-a-kind, 13-foot tall, fully rotating rotisserie. With 70 high-definition televisions, subscriptions to all major sports cable packages and a Yahoo! Sports ticker that will run through the space highlighting fantasy football stats, Bourbon Pub will be the ultimate viewing party location for any sporting event, on any given day. Bourbon Steak offers a more private, premium dining environment for the true Michael Mina steakhouse experience. With a focus on seasonal regional cooking, Bourbon Steak will feature tableside service with a heightened guest experience, along with steaks that are sourced from premium producers from around the world. Signature dishes will be served directly from the rotisserie and a state-of-the-art seafood boiling station, and will include items such as Certified Prime Angus steaks, A5 Japanese Wagyu, Dry-Aged Duck for Two, Wild Striped Bass, Black Truffle Mac and Cheese and innovative vegetable sides from famed South Bay farms. Guests dining in Bourbon Steak can also enjoy a flight of spirits from the restaurant’s Bourbon Cart, individually smoked tableside to accentuate the flavor profiles of each. Echoing the high level of innovation found in every corner of Levi’s®Stadium, Bourbon Steak & Pub features a state-of-the-art open kitchen, delivering a culinary theatre with a wood-burning grill, a seafood action station with a floating suspension frame that elevates the burners, and a show-stopping, one-of-a-kind, 13-foot tall, fully rotating rotisserie that’s equipped to hold up to 1,000 pounds of meat. Located on the ground floor of Levi’s® Stadium at 4900 Marie P. DeBartolo Way in Santa Clara, Bourbon Steak & Pub welcomes Bay Area diners seven days a week, year-round, with Bourbon Pub open for lunch and dinner, and Bourbon Steak open for dinner only. Additionally, before the start of each home game, Michael Mina’s Tailgate will kickoff in the tailgate area of the restaurant, a member-only experience for 49ers season ticket holders, inspired by Chef Michael Mina’s elaborate, themed tailgate parties he has thrown with 49ers fans for more than two decades. Additionally, Chef Michael Mina is pleased to announce the appointment of John Cahill, recently the Chef de Cuisine of Café des Amis in San Francisco, as Executive Chef of Bourbon Steak & Pub. Cahill has a multi-faceted role at Bourbon Steak & Pub, overseeing the whimsical pub-style lunch and dinner menus for Bourbon Pub, and the signature high-end steakhouse menu for Bourbon Steak. “We’re building something that could revolutionize the stadium experience,” explains Cahill of his new role. For additional details on Bourbon Steak & Pub’s menu and Michael Mina’s Tailgate, visit www.BourbonSteakandPub.com, ‘Like’ BourbonSteakPub on Facebook, and follow @BourbonSteakPub on Twitter and Instagram. Mina Group Inc. is a San Francisco-based restaurant management company specializing in creating and operating upscale, innovative restaurant concepts. Mina Group is led by Chef/Owner Michael Mina whose accolades include James Beard Foundation “Who’s Who of Food and Beverage” inductee in 2013, Bon Appétit Chef of the Year, Food Arts Silver Spoon Award Winner, San Francisco Magazine Chef of the Year, and International Food and Beverage Forum’s Restaurateur of the Year. Operating since 2002, Mina Group currently manages 22 restaurant properties including MICHAEL MINA in San Francisco (Esquire Magazine’s Restaurant of the Year 2011); BOURBON STEAK and CLOCK BAR at The Westin St. Francis on Union Square in San Francisco; RN74 at Millennium Tower in San Francisco and RN74 at the Joshua Green Building in Seattle; PABU and THE RAMEN BAR at 101 California in San Francisco; BOURBON STEAK & PUB at Levi’s Stadium in Santa Clara; STRIPSTEAK at Mandalay Bay in Las Vegas; MICHAEL MINA Bellagio at Bellagio in Las Vegas; MICHAEL MINA 74 at Fontainebleau Miami Beach; LOCALE MARKET and FARMTABLE KITCHEN at Sundial St. Petersburg in Florida; and THE HANDLE BAR in Jackson Hole. For a complete list of restaurants please visithttp://michaelmina.net. Levi’s® Stadium will be the new home to the San Francisco 49ers, and will also serve as one of the world’s best outdoor sports and entertainment venues. It was designed by HNTB and is being built by Turner/Devcon for the Santa Clara Stadium Authority. The $1.2 billion venue will have 1.85 million square feet, seat approximately 68,500 and feature 170 luxury suites and 9,000 club seats. It was designed to be a multi-purpose facility with the flexibility to host a wide range of events, including domestic and international soccer, college football, motocross, concerts and various civic events, and will be expandable for major events such as the Super Bowl. Levi's® Stadium is owned by the Santa Clara Stadium Authority, a public joint powers authority that was established to provide for development and operation of Levi's® Stadium to ensure that the stadium serves the goals of the City of Santa Clara. For more information, go to www.LevisStadium.com.